Nhan, who is on a working visit to Israel, highly valued the country’s experience in developing technology, smart cities and start-up ecosystem. He noted that despite different population and geographical conditions, both HCM City and Tel Aviv are the economic locomotives and high-quality human resources hubs of their respective countries. 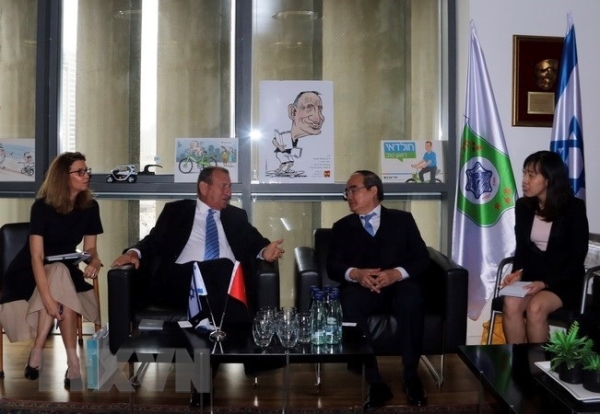 HCM City is interested in promoting a knowledge economy and green growth basing on science-technology, innovation and start-up, he said, adding that his city wants to learn from Tel Aviv’s experience in this field, which is also the strength of Tel Aviv. As the two cities share similarities in smart city building targets, which are to provide convenient services and improving living conditions for local people, they should step up cooperation and sharing experience in smart city building, the official said. For his part, Mayor Ron Huldai said Tel Aviv is an economic and cultural centre and also the biggest start-up city of Israel. It is also experienced in building a smart city and providing smart city solutions. He said Tel Aviv is now one of the smartest cities in the world thanks to an open data system for all people, applying hi-tech in administrative activities, and putting people in the centre of its innovative activities so as to provide services best serving people. Its administration has also built a 15-year strategic vision and made reviews and updates to continue developing this plan in the future. He expressed his city’s willingness to cooperate with HCM City in creating start-up incubators and exchanging experience in smart city building. He also invited HCM City to attend an innovation week hosted by Tel Aviv in the time ahead. Also on May 22, the Vietnamese official paid a courtesy call to Israeli Minister of Science and Technology Ofir Akunis. Who will invest in tissue banks?